This woman is all of Us! 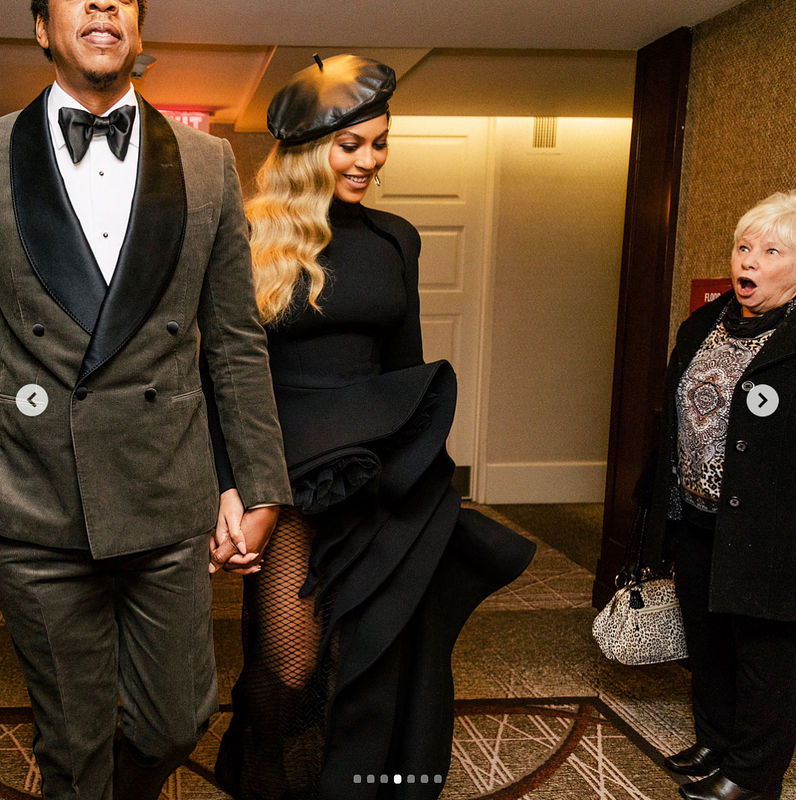 Beyoncé and Jay-Z were photobombed by a starstruck fan, and the hilarious snap is already on its way to becoming a viral meme. The “Formation” singer, 36, shared a series of pictures on Instagram on Sunday, January 28, of herself and the “Family Feud” rapper, 48, heading to a pre-Grammys party the night before. In one particularly notable shot, the couple walked through a hallway in their hotel while holding hands. Sounds normal, right? Look closer. An unidentified woman, possibly a fellow hotel guest, stumbled upon the power couple, stopped dead in her tracks and stared at them with her mouth agape. Queen Bey and Hov had a busy weekend leading up to the 2018 Grammy Awards. He hosted his annual Roc Nation pre-Grammys brunch at One World Trade Center’s One World Observatory in New York City on Saturday, January 27. Later in the night, the “4:44” rapper was honored with the Salute to Industry Icons Award at Clive Davis’ annual pre-Grammys gala at the Sheraton Times Square. Beyoncé attended both star-studded events with her husband, with whom she shares daughter Blue Ivy, 6, and twins Rumi and Sir, 7 months. Jay-Z leads this year’s Grammy nominations with eight, including Album of the Year for 4:44. The 2018 Grammy Awards air on CBS on Sunday, January 28, at 7:30 p.m. ET.